Overcoat with velvet collar. La Mode 1832. Home » Overcoat with velvet collar. La Mode 1832. Redingote à collet de Velours. La Mode 1832. Overcoat with velvet collar. Romantic era costumes 1832. Redingote à collet de Velours. Filet de Chaly. Pantalon de Casimir habit à boutons ciseles Pantalon de Casimir. 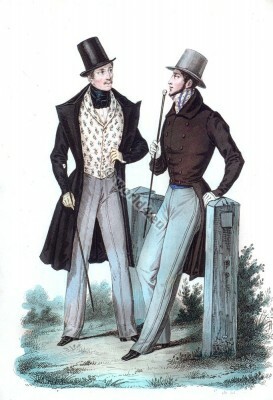 La Mode 1832. Journal et gravures des mode. Bibliography of costume. Romantic Era, Restoration. The Second Republic. 1848 to 1851. Fashion in the Reign of Philippe. 1830 to 1848. Reigns of Louis XVIII. and Charles X. 1815 to 1830. The Restoration period. This entry was posted in 1832, 19th Century, France, Restoration, Romantic Era and tagged Dandy, France restoration costumes, La Mode, Romanticism fashion on 3/22/15 by world4.